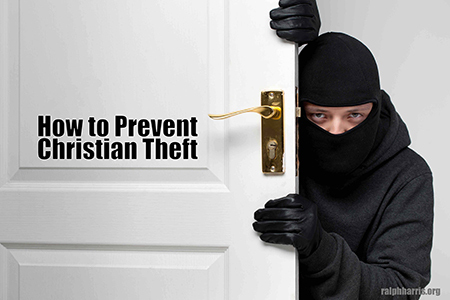 How do we get robbed as Christians? If we are induced into navigating relationships (and everything else) not by the Spirit in us, but by the designs and the here’s-how-to-get-along-with-EVERYBODY instruction of this world, we will not know the fact, power and authenticity of Christ in us—the real deal of Christianity (Colossians 1:27). Even if we attempt to navigate by LOVING EVERYBODY, we will have chosen a method, a be-nice-to-everyone template (Really good manners! Better than anyone else’s!) that excludes knowing and enjoying the life and love of Jesus Himself. In other words, we’re cheated, we’re robbed of Jesus in us—and the world is too, because it’s not going to see and experience Him from us . . . but something less . . . something else. In the great love chapters of 1 Corinthians 13 and 1 John 4, the point is that life and love come from God in us, and work out from there. That’s the promise, that’s the offer and wonder of Christianity—Perfect Himself, the original source, comes to live in us! And the design of God to live in man—in you and in me—is fulfilled and has a staging area in this world in your relationships and in every part of your day. Him for you. And Him for everyone. Life is Christ; anything else is something else. And it’s not for you. So the high goal today—It’s really difficult!—is to enjoy Jesus, the real deal. And watch what He will do in you and with you. You’ll like that, and it will be much easier than you thought. Next PostNext YOU’VE GOT IT ALL!